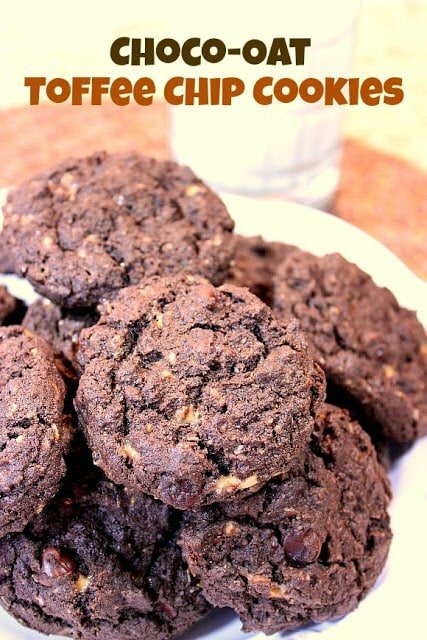 Chocolate lovers, do I have a cookie for you! 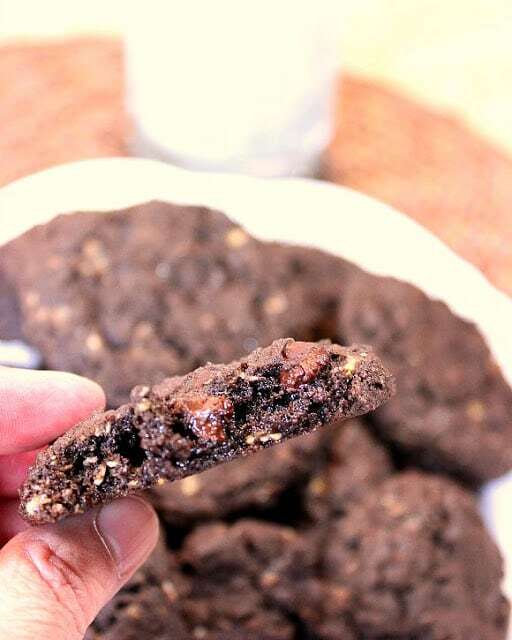 These crispy Choco Oat Toffee Chip Cookies will satisfy your desire for chocolate and toffee in one crispy cookie. I made these cookies to bring to my brother and sister-in-law’s lake house this past weekend. They travel well, satisfy a sweet tooth, and also contain oats so you don’t need to feel all that guilty if you eat five or more… Who me? -In a large bowl, cream together the butter, brown sugar and granulated sugar until light and fluffy. Blend in the eggs and vanilla extract. 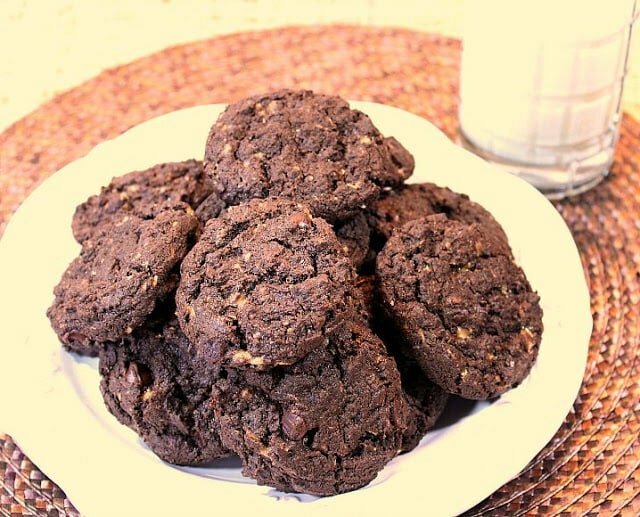 -In second large bowl, whisk together the flour, oats, cocoa powder, baking soda and salt. Add the flour mixture into the butter mixture in one third increments, blending well after each addition. Blend in the toffee bits, chocolate chips and nuts (if using). 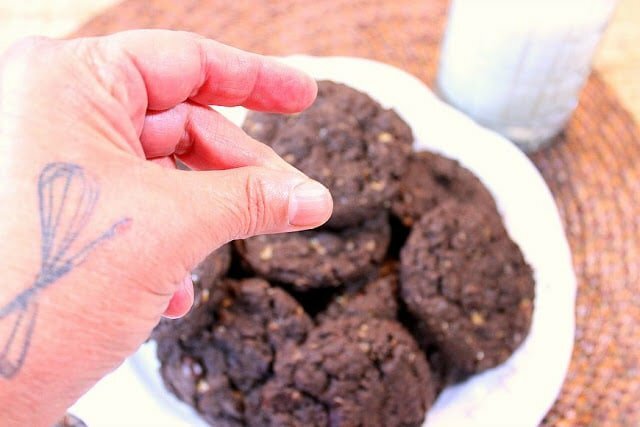 -Drop the cookie batter in tablespoons (I use a small ice cream scoop) onto baking sheets that have been lined with parchment paper (one dozen cookies per sheet). Bake in a preheated oven for 18-20 minutes, rotating the sheets halfway through the baking process. 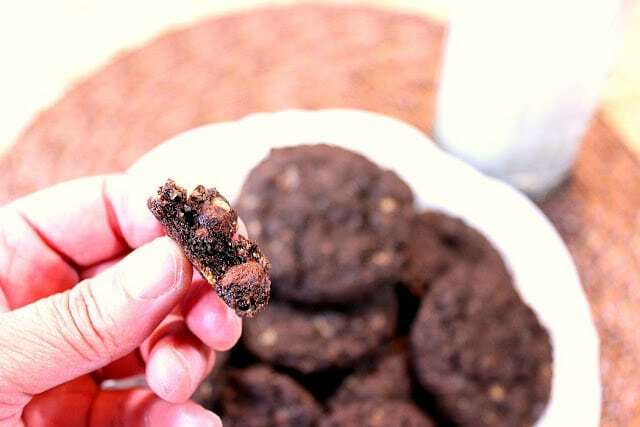 -Remove from the oven and allow the cookies to cool on the baking sheets for 4-5 minutes. Remove the slightly cooled cookies to a baking rack to cool completely. Continue the same process with the remaining cookie dough. And since I was telling you that I brought these cookies to my brother and sister-in-law’s lake house, here are a few photos from that weekend. We had such a good time. Their lake house is just perfect. 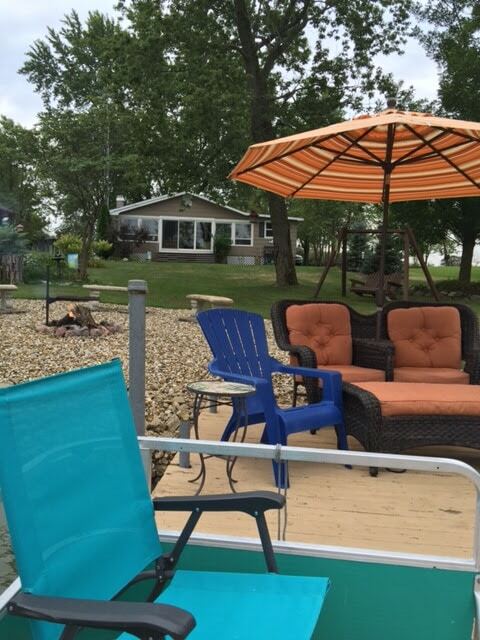 It’s on Bayles lake in Illinois. 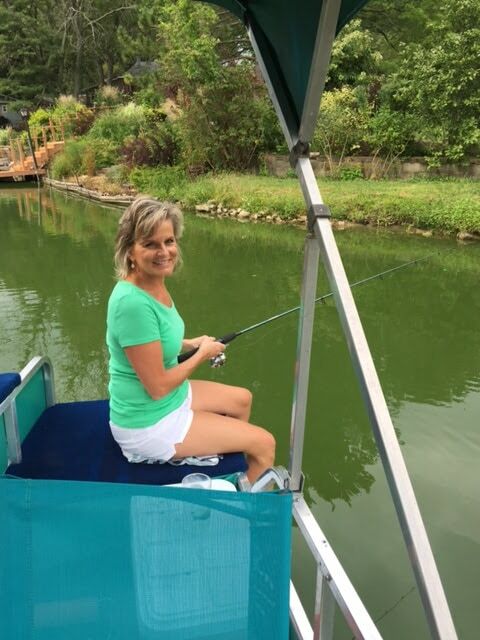 This is my sister-in-law, Pam. Isn’t she adorable? And of course no post would be complete without the addition of one (or two) of my painted pieces. 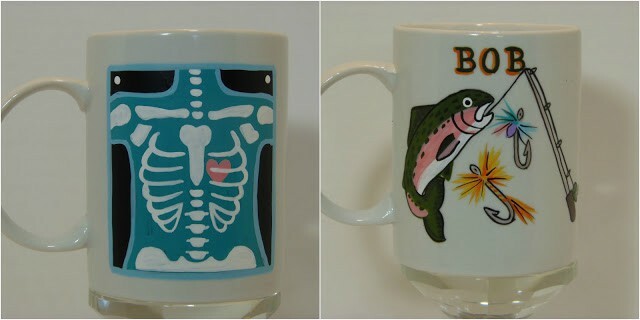 Here are two mugs that I painted for Bob and Pam a few years back. 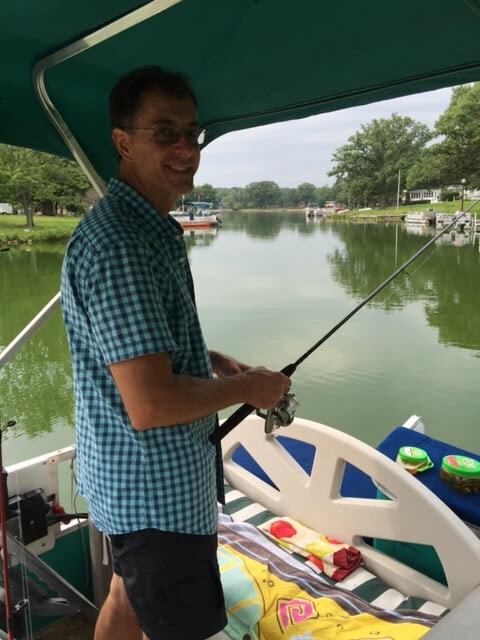 Pam is a x-ray technician, and, as you can see, Bob loves to fish. If there is ever anything I can paint for you, from glassware, to aprons, to tea towels, please feel free to contact me or visit my shop on Etsy. Custom orders are always welcome and always encouraged. Love the combo of toffee and chocolate and love those mugs you painted! These would not last long in our house. What fun photos! Anything with chocolate and toffee is bound to be addictive. 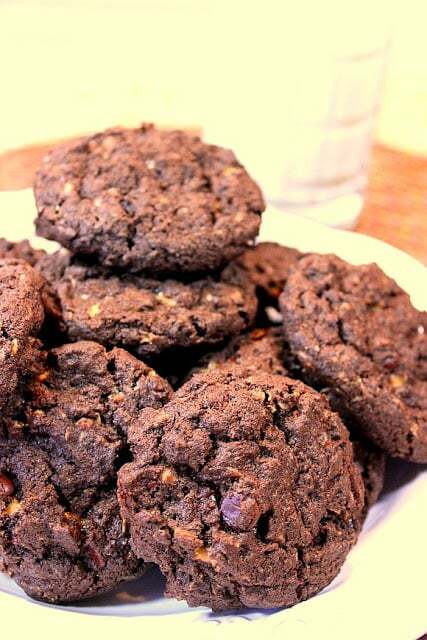 These look like the perfect cookies to bring on a picnic. Whoa, these flavors sound amazing together! And that lake house really is beautiful! Oh yeah….I can totally see why these cookies get devoured! YUM! Love meeting you family! 🙂 I'll be adding these cookies to my holiday baking this year. 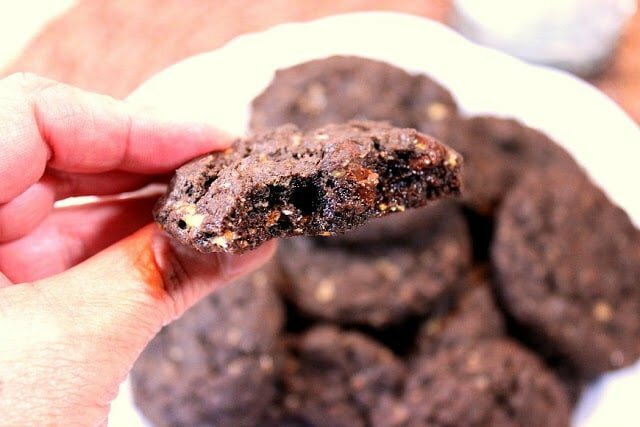 I love oats in cookies, but I can't remember ever having a chocolate based oat cookie (other than a no-bake) – these look fabulous! And you have a twin? How cool! They look so thick, chewy and like the have an amazing texture. Love the added toffee! Ooh look at all that chocolate! I'll have a bunch please and I love oats in cookies. Love the extra oomph and flavor it gives to them. Mmmm! I'm imagining how delicious the toffee bits are in there! Want! !